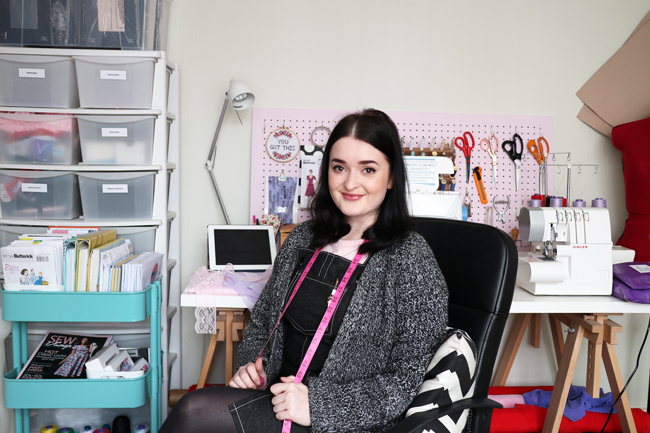 Tilly and the Buttons: Sewing Space Tours... Abi's Pretty and Practical sewing space! 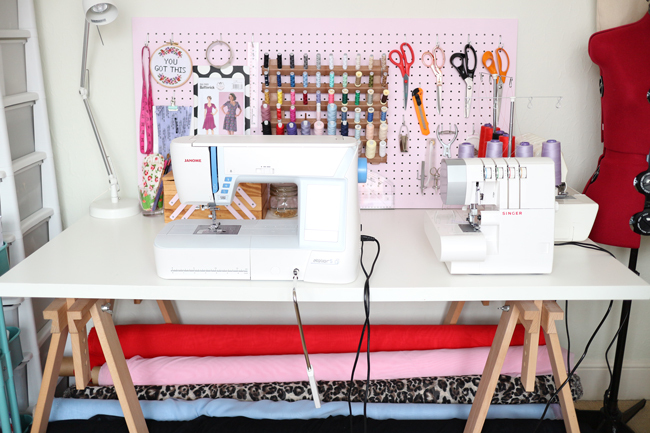 Sewing Space Tours... Abi's Pretty and Practical sewing space! Hello! 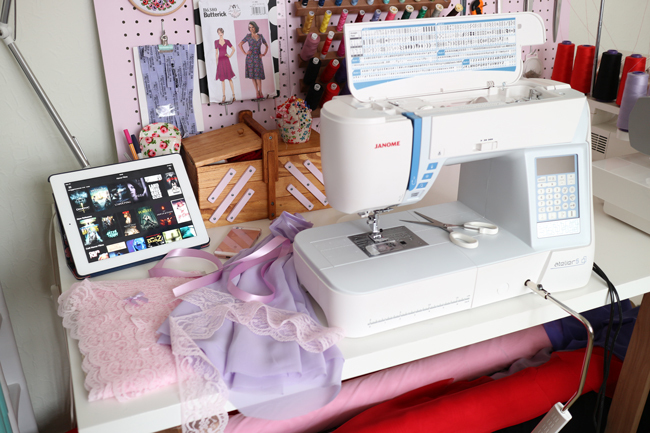 Lexy here with the latest in our Sewing Space Tours series, where we are offered an insight into a reader's sewing area. 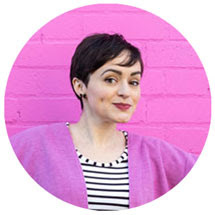 Today, the lovely Abi is showing us around her slice of pastel heaven. Over to Abi for more! Hello! I'm Abi and you can find me blogging about my retro dress making over at The Crafty Pinup. Welcome to my sewing space, which is also where I also run My Retro Closet, my vintage inspired handmade lingerie and nightwear business. I live in Shrewsbury, a pretty Tudor town near Wales, with my family. I work from home in what was once a dining room, and is now my very own little studio. Along with my sewing space, I have a separate office in the house for all the boring admin and non-creative computer things, which isn't very exciting! 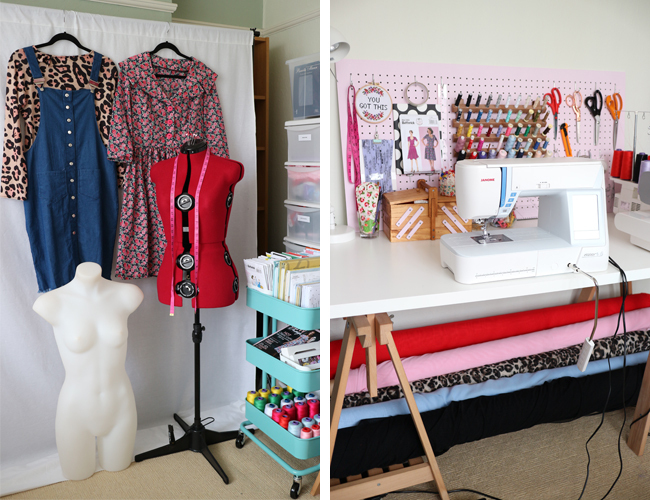 My sewing space has changed dramatically in the last year, with some wonderful upgrades in the past couple of months. It just so happens that my sewing space is also the lightest and brightest room in the house with lots of space to create. I'm very lucky to have a handy boyfriend who loves a spot of DIY. 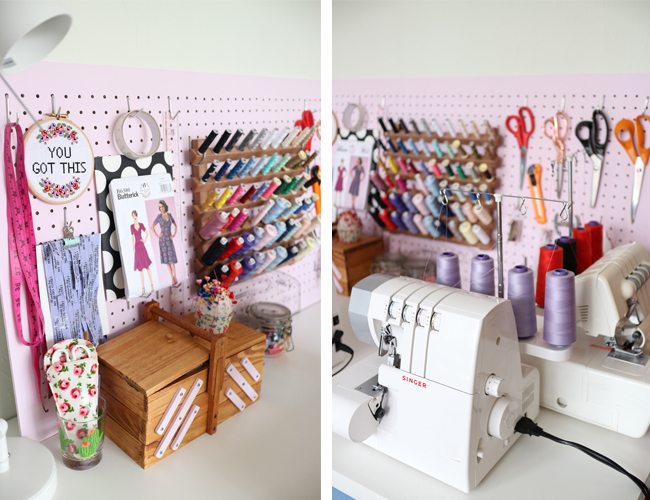 He made me a beautiful baby pink peg board earlier this year from scratch and gave my vintage style wooden sewing box a stylish upgrade to match. 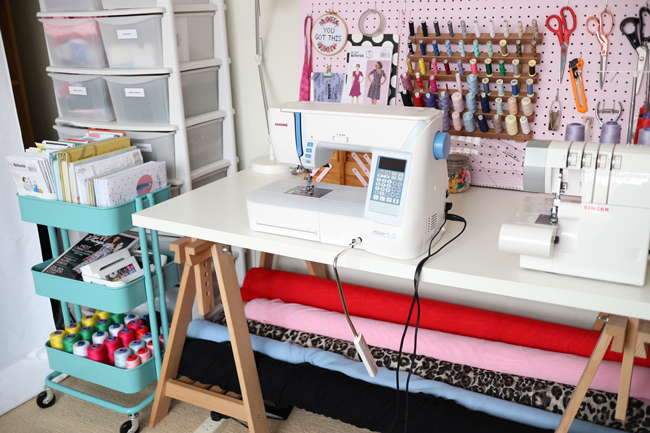 These additions really make my space feel like mine as well as making it super functional for my personal sewing projects and my business. Running my lingerie business from this room means I need a space that works with me and everything has it's place. I'm a bit of a neat freak and love organisation (I have a whole Pinterest board dedicated to it!) 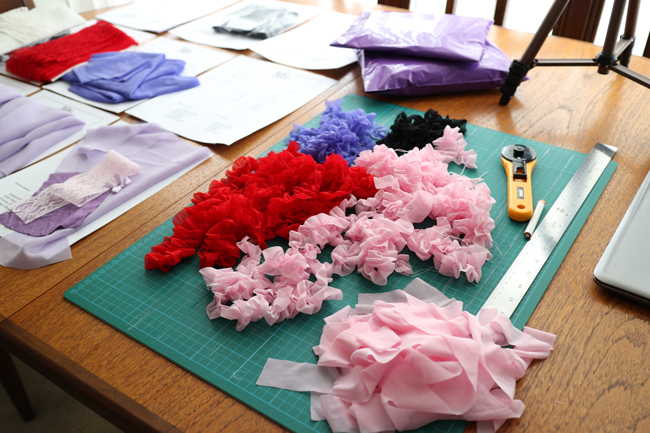 and I can't sew when everything is a mess! 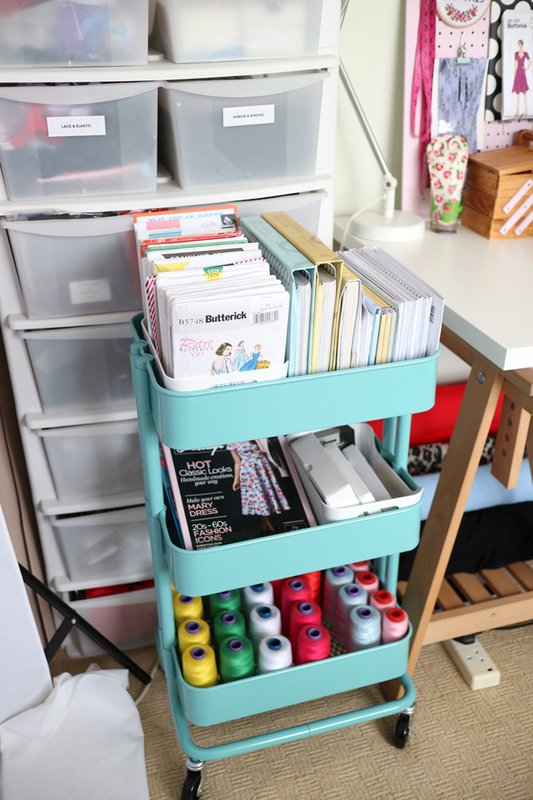 I love the cheap and cheerful plastic draw stacks as they click together easily, don't take up too much room and they can store (hide) all kinds of things! 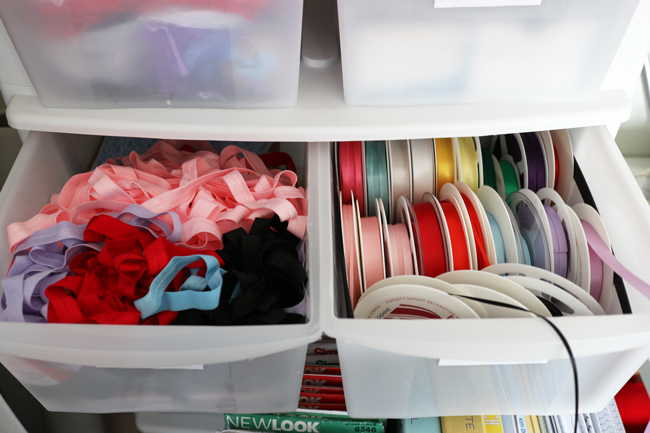 I keep everything from packaging materials, to ribbons and elastics, to my wholesale lingerie stock in them. Being the anti-hoarder that I am, my fabric stash is no where near as impressive as others! I'm ashamed to say, my stash doesn't extend any further than a medium sized plastic tub.... however, I love the small selection I have and each has a project waiting for it! 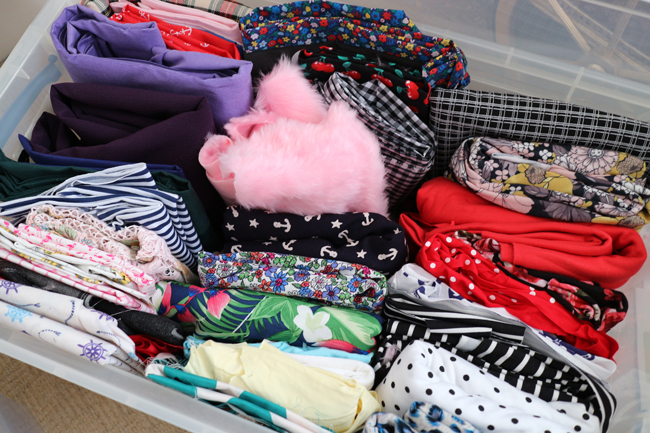 Along with a small fabric stash, my pattern stash is much the same. Modest and tidy, and waiting to be made! I store all my printed PDF patterns in a folder along with a handful of sewing books, including Love at First Stitch of course! My self-drafted nightwear patterns hang in the room on a coat hook rail that handily slots onto the picture rail. I also have a collapsible photo back-drop, which I initially bought for photography for My Retro Closet but has since been great for photographing my dress making projects against for my blog. I love clear and bright images! Under my desk is where my colourful rolls of chiffon and mesh lie, in constant rotation for lots of lovely lingerie and nightwear. 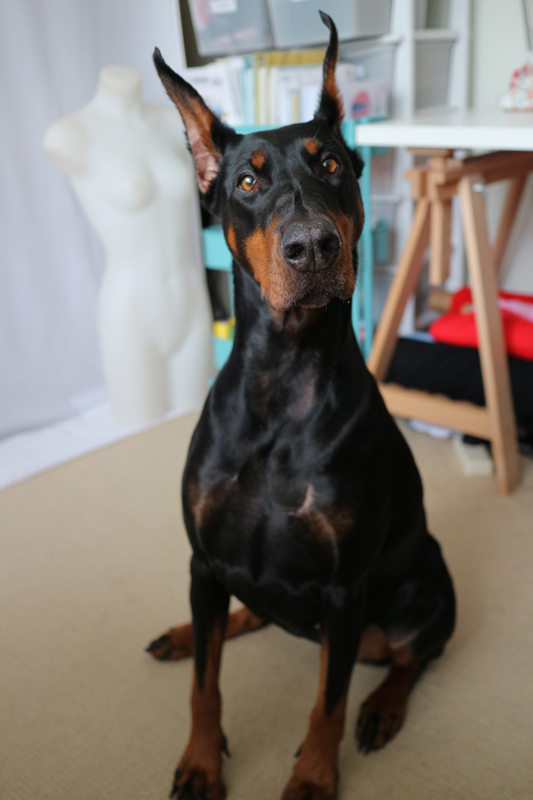 If anyone ever views my Instagram Stories, you'll know it's rarely sewing related and mostly my sassy Doberman, Rona, barging around the room either needing cuddles, guarding my lunch, or wanting dinner. I'm forever trying to find a way to pat her and sew at the same time! If I'm lucky, she'll settle for a blanket folded up as a bed by my feet. Although I'm careful not to leave a cut project on the floor - she'll happily sit on that too! Whilst I'm sewing, in contrast to the girly, frilly things I'm sewing, I love watching horror movies and anything paranormal. It's no exaggeration to say I've nearly watched the entire horror section on Netflix, and give me a spooky YouTube channel any day! A creepy watch along with a big mug of tea, a sausage sandwich, and PJs is my slice of heaven in the sewing room. 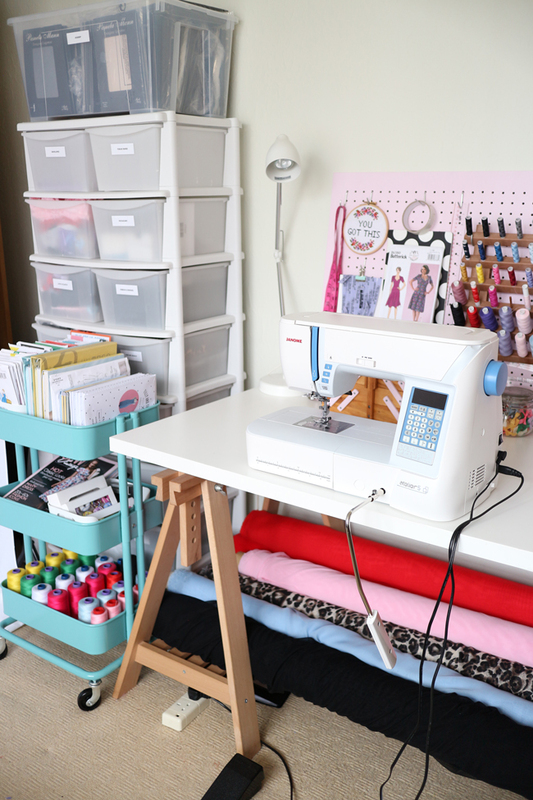 My sewing space is ever evolving as my business grows, and I'm always lusting after other spaces on Pinterest, but right now I'm very happy with mine (which I need to be when I can spend seven days a week in it). It's bright and functional, with some retro touches, and who wouldn't be happy when surrounded by ruffles? I hope you've enjoyed seeing my space! Thank you so much for sharing your space with us, Abi! 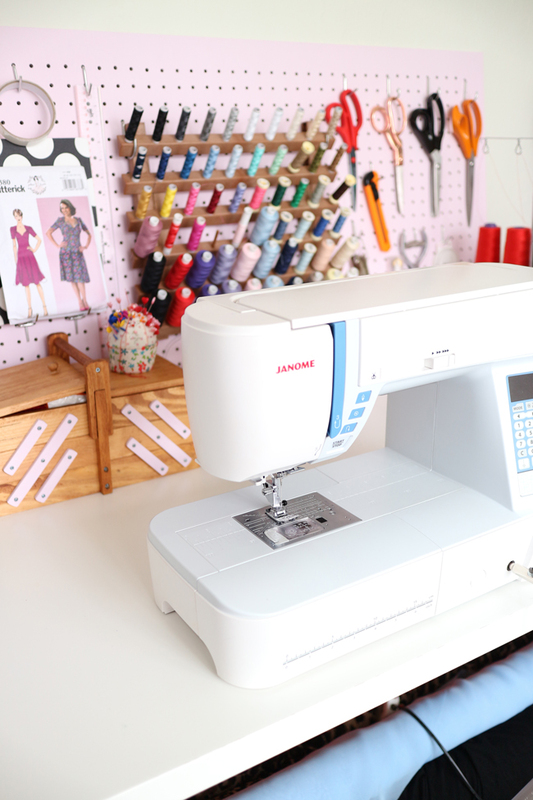 It's a gorgeous mix of girly and practical, and there's a lovely canine to keep you company! 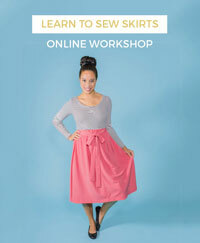 Have you seen the other spaces in our Sewing Space Tours series? There are some serious lust-worthy spaces to check out. 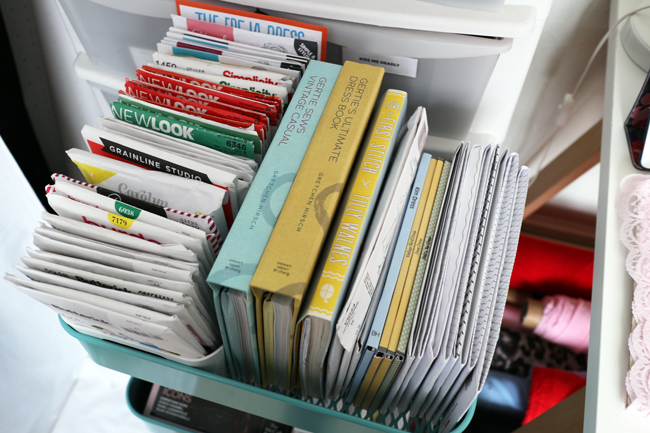 Fancy seeing you space on the blog? Take a look at our submission guidelines. Your Pets on Our Patterns!